I'm using these as indoor curtains in my dining area, and they look great! Love the green color and the trellis pattern. They haven't faded at all even though they get sun most of the day. Great pop of color that we needed on a boring wall. Enjoy privacy with style on your patio with Madison Park curtains. 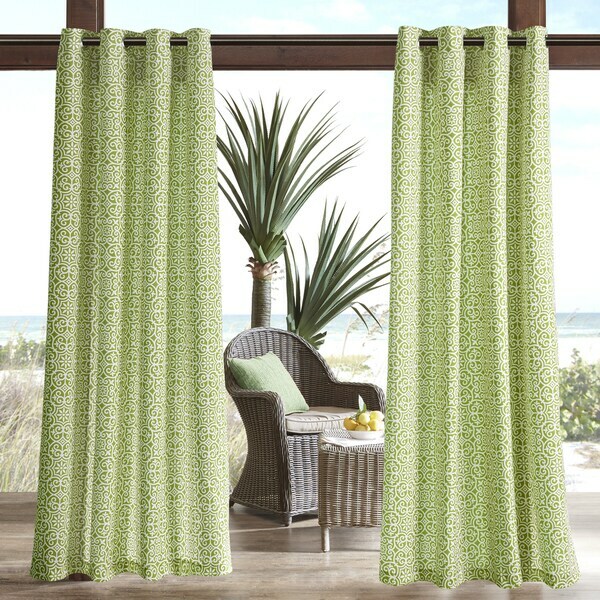 Made of Scotchgard fabric, these curtains repel moisture and stains for long-lasting outdoor beauty. The color brightens the space while also blocking UV rays. Dimensions 9.0 In. X 12.0 In. X 3.0 In. These outdoor curtains are fabulous!!!! I ordered these to go along with my decor for my back porch for privacy they make it look like an outdoor beautiful oasis! Stunning and I could not believe the sale. Perfect color, length and fabric to protect my patio doors from the New Mexico sun. I'm giving this three stars only because it's not scotchgarded as stated. The curtains itself looks great however, who wants to keep wasting hundreds of dollars for outside curtains that will get damaged from mildew and mold because it's not made for outside. These curtains would be great for inside not outside. These are so beautiful in reality! Perfect for the back porch to add privacy but still have a feel of fresh outdoors. The green is a bit softer and prettier even. Highly recommend! I loved these panels for my patio and ended up buying 2 more later because our patio is really wide. I paired them up with two solid color green panels from another site and it looks stunning! Purchased these for my outdoor deck! Absolutely the best quality. They are better than what I expected! Good quality curtains, looks beautiful! Very well made and look great on our patio. Have not worn or faded even through the winter months. While there was nothing wrong with these, I did return because the color online looked nothing like what came. Is not a kiwi green, but more of a kelly green so they didn't work at all. Could have made into a dress for St Patrick's Day if I could sew! Is so hard to get color right when you order things online and all our computer screens look different. Purchased this and an outside rod for the front porch area. We needed something that we could use to block the late day sun and it works perfectly. The color is a bit brighter than I expected, but I've gotten used to it now and actually really like it. These curtains are so cute and bright, love them. They’re even and hang beautifully. Be sure to order enough for coverage. I bought these curtains to hang on my front porch for both privacy and to block the afternoon sun. They are holding up perfectly with no visible fading. I would definitely buy again! "Is each panel measured 50 inches"
This listing is for a single panel that measures approximately 54 inches x 84 inches. "What color are the grommets?" "Do the curtains show the same from both sides or is it lined on one side and has the pattern on the other?" "is it possible to use these curtains for indoor large wall-size windows?" "can these be left outside in the weather?" "Is this price for one or two panels?" This is for one panel.